We were warned before arriving at Garden City Golf course that it was a little, well, eccentric. The place has a reputation for being a relic of a bygone age – where ‘men were men’ and women were neither seen nor heard. The reputation is fully deserved. There is a sign welcoming you to the club making it clear that jackets must be warn at all times. Actually, that only applies to the inside lounge and dining areas. You can eat on the terrace outside sans jacket without fear of being kicked off of the premises. For sure this place has some quirks. The locker room is the closest thing I have seen to a school changing room for over 25 years, in fact I imagine there are few school changing rooms in the Western hemisphere as antiquated as this. There are only 399 members at the club – apparently if they got to 400 members they would have to start allowing women some rights of access which the members aren’t ready for just yet. So yes, there are some odd things going on but the people we met were all very friendly and charming and didn’t seem to mind my pink shorts one bit! So, to the course. This had hidden gem written all over it before we played. The course is built on sandy land, but not a links. I had been led to expect something more akin to one of England’s heath courses. 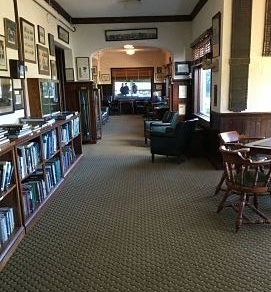 As always the Golf Club Atlas site was a great source of background reading with this write-up here - http://golfclubatlas.com/courses-by-country/usa/garden-city/. You will read there how the course was crafted by Devereux Emmet and significantly developed by Walter Travis following the 1902 US Open. And so, it was with a real sense of expectation we wondered onto the first tee – a 300 yard par 4. A perfect yardage for my first hole! We had a couple of perfectly good caddies – mine was an Irish guy who worked hard to endear himself all the way round – who assured us we were in for something quite special. And, I’m afraid it didn’t quite hit the mark for me. Maybe it was that we came to Garden City having played some of the real top drawer courses in the area and were too blinded by what we had seen but it just felt a bit, well, OK. The course was very playable – open and everything was in front of you at all times. It is said by some to be a triumph of minimalism, actually we found it a little featureless. Sure the bunkering was interesting (many of which were upturned which was an unusual addition) and there was a lot of strategy involved with putting together a good score I’m sure, but the course never really got the juices flowing. Don’t get me wrong there was much to enjoy – there’s a nice gentle opening par 4 followed by a lovely short par 3 over a quarry. The course then heads out through a very pleasant few holes which will use plenty of the clubs in your bag. Tom Doak did a lot of work on the course a few years ago and without a doubt there is plenty to keep you interested – especially around the greens. Looking back on my round here I can’t really remember that many of the holes clearly – not a great sign. The finish was again an interesting one – the par 5 17th yielded an eagle from our group before the knee-knocking finishing hole. A mid length par 3 over water. I managed a big hook to the first tee which made for an unusal angle for my second! After the round we enjoyed a tour of the clubhouse. As you would expect for a place that hosted a US Open, 4 US Amateurs and a Walker Cup all before 1936 was out there is much to see. The club historian was there and did a great job at telling us some of the stories from the past - you really felt that you were stepping back in time. This was a hard course to score. If you were a real architectural nut who was there to appreciate every nuance of the ground maybe you would appreciate it more. For me, I just couldn’t fathom how this had a place in the top 100 in the world. One of my playing partners showed his Neanderthal qualities in the extreme by suggesting quite volubly on the drive back from to Manhattan that the when he suggested it wasn’t much better than a local council course in the UK. That was harsh for sure. However, it is probably a course to go in with you expectations low and prepare to be surprised and delighted rather than think it will be the highlight of your golfing life! The clubhouse at Garden City is well worth a look around to enjoy artefacts from a bygone era! Well, there are 399 members and one of them has to invite you as far as I can see, therefore this isn’t the easiest tee time in the world to snag.. There are some high end travel agencies who claim they can get you onto ‘bucket list’ experiences so maybe give one of them a try but if truth be told I wouldn’t pay too much for the honour. Garden City is very doable from Manhattan – time depending you can drive it within an hour – and is a good stop-off on the way to the Hamptons. That’s about all I have to say I’m afraid as we came in and out quite quickly! June and September may be the best months to play – out of the cold winter months and away from the oppressive summer heat and storms.